Aloysia citrodora or Lemon Verbena is a wonderful deciduous perennial to grow. It will grow quite large and woody after a few years but if you keep cutting it back hard each year it just keeps resprouting in spring and growing like crazy. I have a selected favourite plant that is about 15 years plus old that looks like an old rose stump about 1.5m high but keeps coming back with the best flavoured leaves regardless of the variable climate each year. They don’t seem to have many pests and are easily reproduced using cuttings in spring – with a little heel of older wood on the base of the cutting if possible. They are hardy and don’t seem to mind cold or heat as long as they get a cool mulched root run with some moisture during the hotter periods. When very young they do need a bit of care and protection in extreme heat and cold. They grow well for a long time in containers too. The taste of the leaves is heavily lemon flavoured with a tiny touch of some sort of menthol or some other like oil that gives it a refreshing cool touch. It always reminds me of the classic Antipodean summer beach ice blocks called ‘icey poles’. You can use the leaves in numerous ways including as a tea or as a flavouring in things like ice-cream or gelato, or even a panna cotta. And they are excellent added to any sort of melon with a good vanilla ice-cream. They mix very well with other lemony flavoured items like Lemon Myrtle and Spearmint Kaffir Lime leaf, lemon balm and actual lemon in any dish. 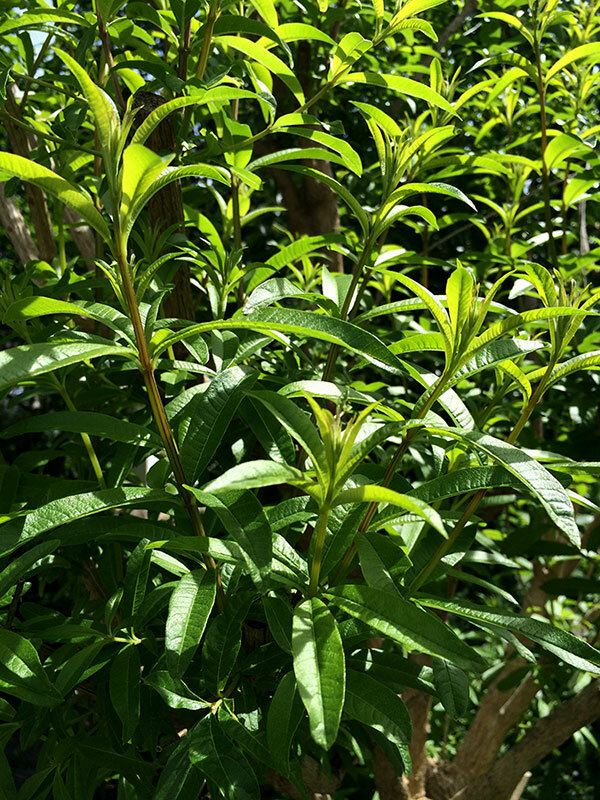 A fantastic tea/tissane can be made by combining lemon verbena, lemon balm and either straight spearmint or morroccan mint. (both of them variations on Mentha spicata). You just drop a freshly picked stem or two of each into a tall heat resistant glass and top up with some hot water and give it a stir. The terminal branch flowers can be eaten too – but have less appeal due to their slightly grainy texture. The leaves can be dried and used later but I find there is no replacement for the fresh leaf taste. There are many variations to the flavour so it pays to carefully search around and actually taste them. Some I have originally labelled as ‘Lime’ verbena are often quite unpleasant. I grow about 7-8 variations that all taste subtly different but like the mint family they are on a sliding scale from unpleasant to wonderful.